Vembu: Battered and bruised by a double whammy earlier – man-made and natural – this week, there is an air of expectancy and hope in this little village in Kalkudah on the eastern coast. It is not a blast from the past which has seen the area succumb to the vicissitudes of the 30-year war and the December 2004 tsunami. This is a refreshing breeze blowing from prosperous Colombo to the hapless east. Not just a single ‘handout’ or a sole ‘knee-jerk reaction’, Vembu is to be the home of a multi-pronged holistic project to give a helping hand, long-term, to enable people in this area as well as the whole of the east to rise up with dignity from impoverishment. The MJF Centre for Dignified Empowerment and Sustainable Development – East established at a cost of Rs. 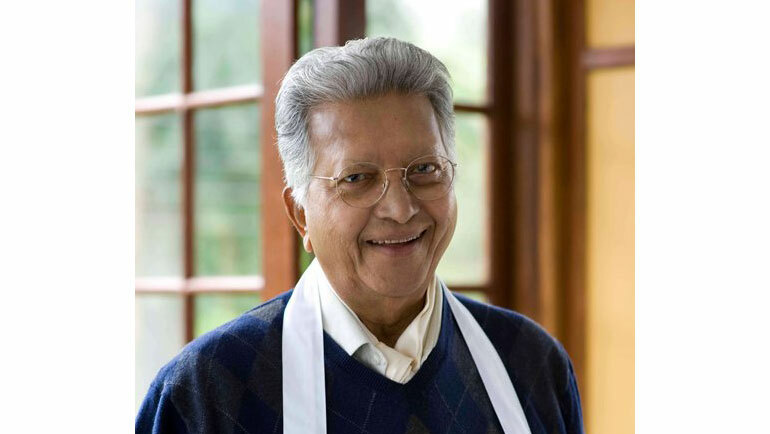 1.2 billion by the MJF Charitable Foundation and Dilmah Conservation is like many other silent initiatives of this tea giant, in keeping with Founder Merrill J. Fernando’s vision, ‘Business is a matter of human service’. The centre was opened yesterday (September 1) by Prime Minister Ranil Wickre-mesinghe. On Tuesday, as the evening shadows begin to lengthen, with the sun sinking into the horizon, we arrive at the 23-acre site in Vembu, off RDS Road, Kumburumulai. The transformation of what once was like a desert — extreme arid conditions (scorching sun and lack of water) with sandy soil where let alone a tree even a creeper could not have survived – is obvious. Now low-slung cozy buildings in different colours, blue, grey and dark yellow, with the tallest being the tower housing the water tanks sprawl across the land. The ‘greening’ process too meets the eye, with trees such as kohomba, kumbuk, ehela, maha-dang, maila and mango scattered here and there, bushes lining the pathways proudly sporting bright flowers, turf hugging the flat rooftops and wisps of creepers flowing down from every roof and also every level of the water-tank building. Birds fly from one building to another, swooping for insects, while a persistent honeyeater keeps flitting back and forth taking a taste of nectar from different flowers. We get an insight into the multi-prongs of this largest private sector funded community project in the Eastern Province, from Executive Administrative Officer Kavitha Nadarajah and Premises Manager Ayinkarathasan Pathmapriyan, along with a walkabout. There was “nothing” here except a few bushes, when they began the project, smiles Pathmapriyan. It was barren land. Then onto the scene came the MJF Charitable Foundation which bought the land outright from the owner and things began to happen since January last year (2017). However, it was much earlier that the Foundation had turned its benevolent gaze towards the east – as way back as 2006, when the area was attempting to limp back to normalcy after the crippling war aggravated by the tsunami. With the opening of the MJF Centre – East, the Dilmah philosophy of transforming socially and economically marginalised people and communities, through knowledge and inspiration, to achieve dignified empowerment, is expected to spread in the area. Similar thinking has been passed down from father Merrill to son Dilhan, Trustee of the MJF Charitable Foundation and Chief Executive Officer of Dilmah Tea who says that every child, youth, woman or man has an inherent ability regardless of perceptions of physical, social or economic disability. “My father’s Foundation has worked towards understanding that fundamental reality and nurturing it through care, guidance and support for differently-abled children and youth, by providing knowledge through training, mentorship and equipment for young men and women who aspire to be entrepreneurs, offering education, healthcare and support for the elderly,” he says. Underscoring that at the heart of all these initiatives is the dignity of the beneficiary, Dilhan says that by protecting that dignity and supporting the individual physically, socially or economically, “we can achieve empowerment and that, I believe, is how we can help that person overcome any disability and nurture his or her inherent ability”. This centre will serve Sri Lanka by building on our engagement in the east since 2006 and help the community to understand and embrace different abilities, understand and adapt to changing environmental and economic conditions and by building entrepreneurs, by advancing knowledge and skills, he adds. Before detailing the multi-faceted programmes which will radiate from this facility, Pathmapriyan touches on something which is very close to Mr. Merrill Fernando’s heart – the Rainbow Centre which will bring under its shelter, love and care differently-abled children. While housing a paediatric physiotherapy unit with state-of-the-art equipment, it will have full-time speech, language and physiotherapists. An early intervention programme for toddlers and special education classes and life skills and vocational training for youth including computer and culinary skills training are planned. Looking at the one-stop MJF Centre – East which comprises 33 buildings, Pathmapriyan explains how it will encompass a fully-fledged Vocational Training Unit for youth to enable them to find jobs or be self-employed; a Computer Unit and a Carpentry and Masonry Unit. Under the Women’s Development Programme, women and girls will be provided with skills and knowledge in home gardening, cooking, sewing, crafts, textile making and more which would help them to improve their families’ nutrition, while developing entrepreneurship and earning an income. Another aspect will be access to psychosocial counselling, according to Pathmapriyan. The crafts turned out by them will be displayed and sold at the Visitor Centre. He says that under the Kids’ Programme, each day after school, children and youth from low-income families will troop in for skills development and vocational training. A library, classrooms, an outdoor and indoor auditorium, accommodation and more are part of the centre. The plight of school-leavers who currently have to bus it to Batticaloa nearly 30km away for vocational training, is highlighted by Pathmapriyan. It is Kavitha who harks back to the past and introduces us to a few of the many beneficiaries who have come under the wing of the MJF Foundation. Thirty-eight-year-old mason, Arumaithurai Karthik with a young family of three, was a casual labourer for masons, finding it difficult to keep starvation from his front-door. Now he employs six others, after the MJF Foundation, under its Livelihood Project, gave him masonry tools such as a grinder, a wheelbarrow, a tile-cutter and a drill to the value of about Rs. 40,000. Karthik is putting-by some cash every month, to collect a nest-egg of Rs. 150,000 (he has Rs. 50,000 already) to buy a block-making machine. As Kavitha explains that earlier he was an unskilled labourer but now he has acquired skills due to the Foundation’s foresight, Karthik puts on his sunglasses, gets on his motorcycle and leaves for work, after waving goodbye to us. The stories are similar…….whereas K. Rajan was wading into the lagoon to earn a few hundred rupees by catching fish and some prawns, the Foundation’s helping hand with basic stuff including a canoe worth Rs. 41,000 has been of immense help. Little acts of kindness such as providing livelihood options, developing entrepreneurial skills, building-up climate resilience through innovative and sustainable concepts and ecosystem restoration have brought hope to the area, where earlier there was only despair. 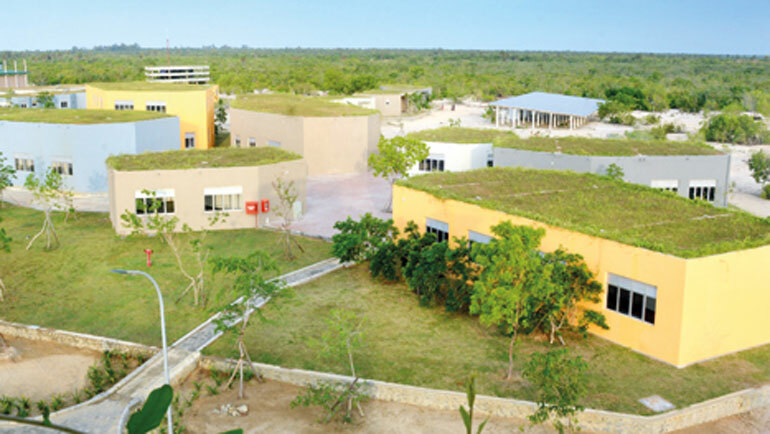 The unique design of the Vembu site portrays a commitment to sustainability and environment-friendly technology. It is hoping to become a carbon negative initiative by reducing its carbon footprint by 35% by 2020 through design and operational aspects. Solar energy and 100% waste water recycling are due to offset the balance carbon footprint.The highlights are: passive ventilation by channelling wind through narrow corridors; use of renewable energy; enhanced natural light; 100% recycling of black/grey water for irrigation; rainwater harvesting; universal design protocols; offsetting the building footprint by 100% through ‘living’ green roofs; and use of purified groundwater throughout the centre. 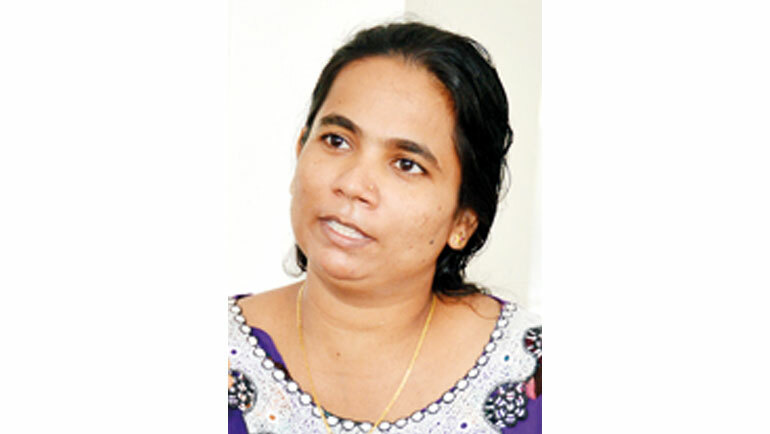 It is a windy morning and sharp at 6 on Wednesday, the Coordinator of Dilmah Conservation’s Eastern Programme T.D. Nidharshan is at Vembu. 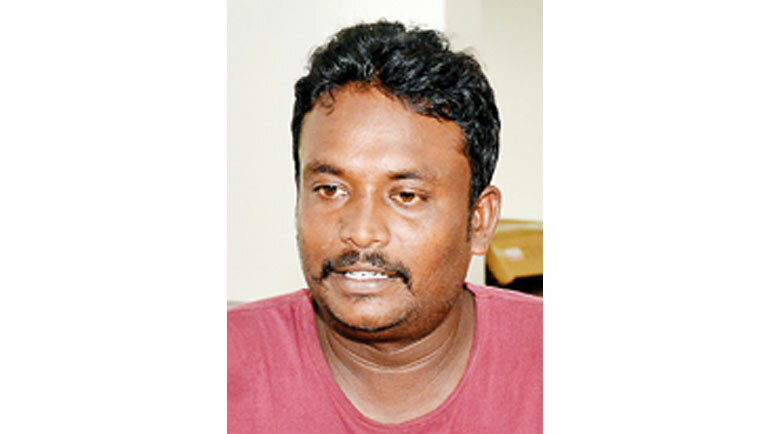 He is in charge of Dilmah Conservation’s Sustainable Agriculture Research Centre. The ‘model garden’ straddling a 2.5-acre plot on the northeastern boundary of the MJF Centre – East features a cashew nursery, a coconut nursery, common and easy to grow maize and beans and gourds in all their variety as well as thampala, both green and red, which can be grown in home gardens and soil enriching gliricidia etc. That morning, large clay pots, with one external half painted a shiny black are being buried close to small coconut plants, with the unpainted porous side towards the roots of the plants. The coconut plot has rows for three categories, ordinary coconut, hybrid varieties and thambili and the half-black pots are a way of conserving precious water. When water is filled into the pot, it will slowly leach towards the root of the plant from the porous unpainted side, preventing water wastage from the other side. 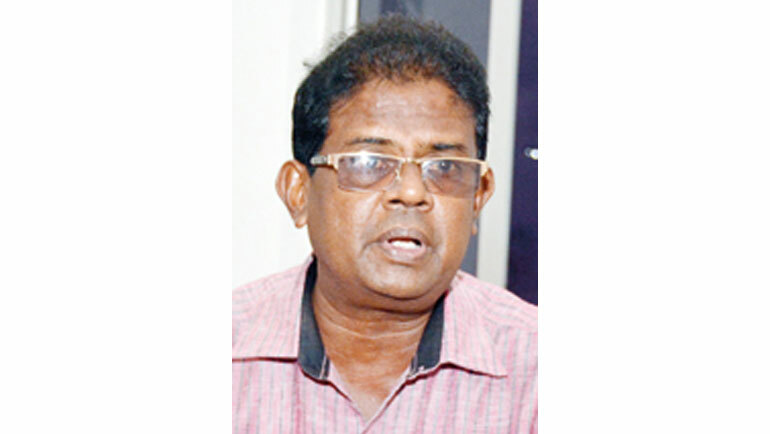 Nidharshan says that Dilmah Conservation launched its eastern greening programme about 10 years ago, for a large number of trees had been destroyed not only in the tsunami but also in the 1978 cyclone. “The ideal crops for the east are cashew and coconut,” he says, adding that cashew can be grown in home gardens as well as a high-scale crop. Did you know that this perennial crop gives a six-metre canopy of green within five years of being planted? The wonder of cashew, a socio-economic forest crop, is that it can be grown on marginal lands not suitable for other crops. So it is a win-win situation when considering the environment and economic benefit. 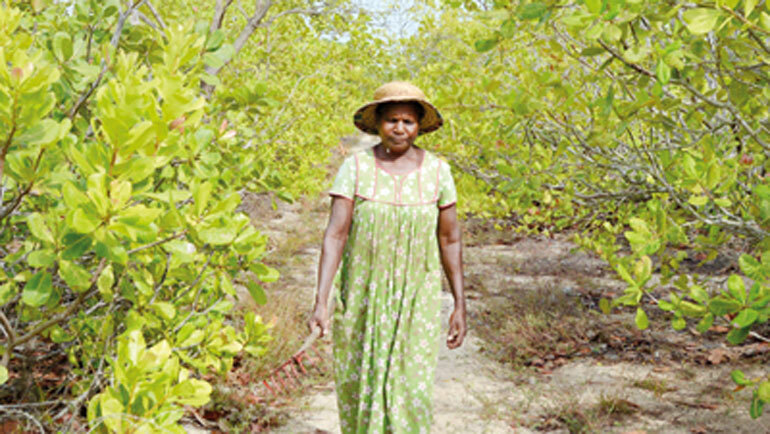 Dilmah Conservation has distributed about 750,000 cashew plants in the east. Just a short distance from the site, we visit a cashew plantation which had got the plants from Dilmah Conservation and a rake-wielding Sithram Sivapakyam, 63, gives a big gap-toothed smile as she says how she has found employment here. She picks and plucks the nuts, after which she helps to dry them and packs them into gunnies, earning Rs. 700 a day. And the Vembu centre will have a ‘Cashew Processing Centre & Marketplace’ for the families which take up this business, with the dual purpose of assisting low-income families and supporting the Greening Batticaloa initiative.